Gege Soriola of Heartland FC is arguably the hottest central defender in the Nigeria Premier League 2010-2011. 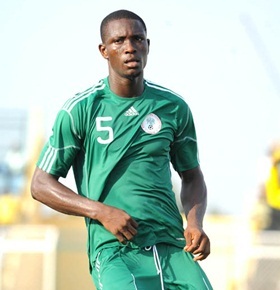 Soriola was recently included in the squad of the Nigeria national football team. In this post, I will present this exciting prospect from a statistical point of view. The first time Soriola made headlines was in the Nigeria Premier League 2007-2008 when he was playing for JUTH FC from Jos in the Middle Belt of Nigeria. Soriola played both as a central defender or central defensive midfielder during the season and was highly impressive. As far as I know, Soriola scored one league goal during the season. The first time Soriola made headlines was in the Nigeria Premier League 2007-2008 when he was playing for JUTH FC from Jos in the Middle Belt of Nigeria. Soriola played both as a central defender or central defensive midfielder during the season and was highly impressive. As far as I know, Soriola scored one league goal during the season. During the season, Soriola was rewarded with a place in the squad of the Nigeria B national football team. Soriola also played qualifying matches for the Nigeria U-23 national football team, trying to qualify for the 2008 Summer Olympics in Beijing, which ended up in success. Soriola also joined the group of players preparing for the tournament and he was part of the Nigeria U-23 national football team that participated in a Pre-Olympics Eight-Nation Tourney in Malaysia in May 2008. Soriola failed to reach the final squad for the Olympics but his progress had been noticed by bigger clubs than JUTH FC. Soriola travelled to Israel after the season and the facts regarding his stay is somewhat unclear. According to http://eng.football.org.il/Leagues/Pages/LeagueGameDetails.aspx?GAME_ID=169311, Soriola played a league match for Hakoah Amidar Ramat-Gan on 24.08.2008 but as the “Ligat Ha’Al” 2008-2009 kicked off on 30.08.2008, I believe this was only a friendly match and that the stay in Israel was only a trial period. It is nevertheless a fact that Soriola joined Nigerian top club Bayelsa United FC before the Nigeria Premier League 2008-2009. Bayelsa United FC ended the season as champions and Soriola was an established member of his new club’s central defence. Soriola did not score league goals during the season. Soriola also played for Bayelsa United FC during the 2009 Orange CAF Confederations Cup and apparently joined Belgian club Sporting Charleroi for trials. The season 2009-2010 proved to be a disaster for Bayelsa United FC as the club was relegated at the end of the season. On the positive note, Soriola won experience from the 2010 Orange CAF Champions League. Soriola also managed to score two league goals for his struggling team. “Soriola was a tower of strength as Nigeria fought from behind to beat archrivals Ghana and qualify for Saturday’s final of the sub-regional cup. Even a section of the crowd have already begun to compare the player with the man who was called ‘Gentle Giant’ in his hey days; Uche Okechukwu. We have been struggling most especially in the central defence, but from what he did against Ghana, he has raised my hope that at least we have somebody who is working very hard to get into the main Super Eagles team. It was a great contribution from him and we will see what happens. On 31.05.2011, it was known that Soriola had been included in the squad of the Nigeria national football team, preparing for a high-profile friendly match against Argentina that was played on 01.06.2011. Soriola was an unused substitute but the inclusion is nevertheless a great achievement for one of the most promising players in the local league. Soriola is born 21.11.1988 and is described as a strongful, “hard-as-nails” central defender who can also play as a defensive midfielder. His full name is Gege Oluwafemi Soriola. He is sometimes known as “Gege Goriola” or “Gege Toriola”. The picture is taken from MTN Football. Since more and more companies are using sales promotions in order to win consumers, it is highly essential for companies to develop integrated promotion strategies, i. The company will accommodate the holiday spirit enjoyed by most people near the end of the year:. still a great idea if you want to target a slightly smaller group. akonesque@gmail.com. Pls, send me your message! I’m waiting.